Outlook for Mobile – Too Little Too Late, or Just in Time? Just installing Office on your computer used to be enough. Then, there was the dilemma about how to also get it installed on your laptop. Now, you might need office on your desktop, your power laptop, your netbook, and, it seems everywhere else. Microsoft has you covered. What is Microsoft Office Web Apps 2010? Let's start with what Microsoft Office 2010 Web Apps are not. The web apps are not a copy of Google Docs, nor are they a knockoff of Zoho Office Apps, although there are much worse things to be. Web Apps are also not an online clone of the regular desktop Office applications that have become commonplace everywhere. What Microsoft Office Web Apps 2010 are, is a collection of online interfaces that to a large degree replicate MOST of the commonly used functionality of SOME of the Microsoft Office Suite desktop applications. In the end, what Microsoft Office 2010 Web Apps really are is an online solution that is good enough – and no better – for the average user to use in a pinch, or in conjunction with locally installed Office programs. Although lumped together into a single product, because Microsoft already has plenty, there are actually two "versions" of Office Web Apps. The actual product that the end user sees is mostly the same. However, one version can be accessed by anyone in the world who can use a Windows Live account. The other version is for businesses and requires setting up the backend of MS Office Web Apps on a SharePoint server. Only those specifically authorized can use that version. The general public will, of course be primarily concerned about the free online Office web apps hosted by Microsoft itself. In the fast paced world of Internet computing where new versions of software are released with more decimal points than days between versions, Microsoft can be given a little bit of tolerance for having announced far more than has been delivered. Still, it is disappointing that even as the retail version of Office 2010 is set to be released, that so little of what the final functionality will even look like is in place. Even so, the Office 2010 web apps that exist today have plenty of value, especially for those with a "real" copy of Office installed on at least one of their computers. At first glance, the Office Web Apps seem surprisingly complete. As long as you are "just checking the numbers" that your office prepared while you are traveling, the currently available versions of Office Web apps will serve you just fine. Likewise, small edits to the text of a document, or even typing in a standard letter or memo are all handled smoothly and cleanly by Web Apps. Even more impressive is the interface of these online Office applications. 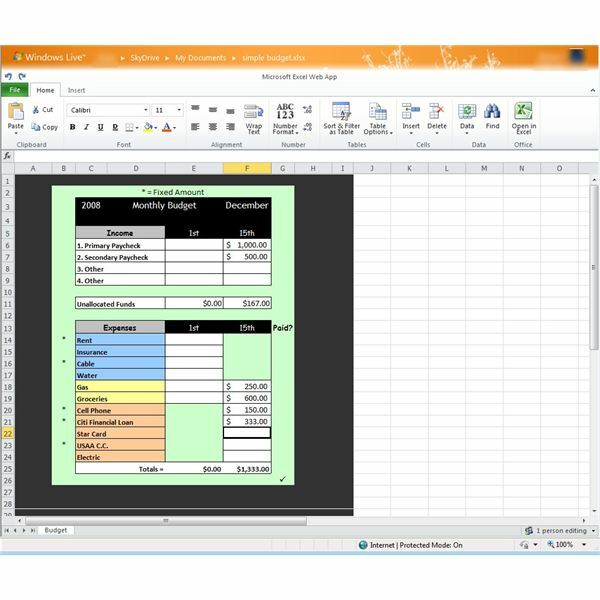 When you first start up Microsoft Excel Web App, for example, it looks virtually identical to the default installation of the desktop version of Excel 2010. Indeed, for basic Office document editing, creating, and collaboration, Microsoft has hit a homerun with the Office 2010 Web Apps. That being said, if you are a power user of Office applications, you will want to stick with the desktop versions for now. 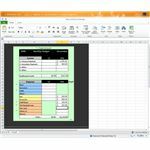 While it would be unfair to expect that every single possible formula available in the desktop install of Excel 2010, for example, be available in the online version, there some missing pieces that can limit the usage of the online versions for advanced users. The Office 2010 Web Apps are still in beta, although anyone with a Windows Live account can sign up. Getting an account is easy. Check here for how to get a Windows Live account. Using web apps is not intuitive unless you plan to create your documents on your desktop first, and then upload them to your SkyDrive before using web apps. To create a new Office document with Web Apps, you first have to login to your Windows Live account (home.live.com) then navigate to your SkyDrive (it's under More). Once there, you'll need to go into one of your folders whether shared or not. Then, look for the "New" along the menu row. From there you can create a brand new Office document with Web Apps 2010 from scratch. Oh, there is one more catch. Currently the only documents that can be created on Web Apps are Powerpoint presentations and Excel spreadsheets. The menu options for Word and OneNote are there, but clicking them reveals a "We're Working On It," webpage. In all, the Office 2010 Web Apps show a TON of potential. Unfortunately, Microsoft has been coy about just how complete the Web Apps will be when Office 2010 ships this summer. Just how far along they are may determine whether or not Web Apps becomes the killer app for MS Office 2010, or if they are just another add-on that nobody really uses very much.